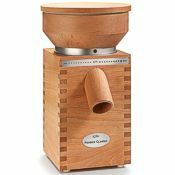 The Wonder Junior Deluxe grain mill comes with interchangeable milling heads: One pair is stone and the other pair is steel. This allows a range of milling options and flour results that can't be matched by other grinders having only a single set of milling heads. 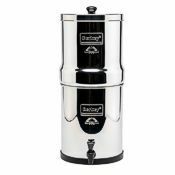 The steel burrs tackle wet or oily materials and are also best for certain dry materials, while the stone burrs provide a fine grind for dry grains and dry beans. 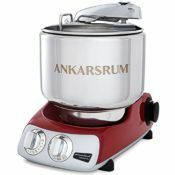 When using either set, the grind is quickly and infinitely adjustable from extremely coarse to extremely fine, or anywhere between. Two optional powering accessories are also available for the Wonder Junior mill—a power drill adapter and pulley wheel—to further extend its usefulness. 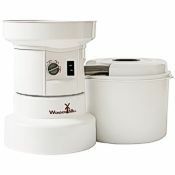 Grinding speed & quality: The Wonder Junior is among the easiest to use hand crank grain grinders on the market. 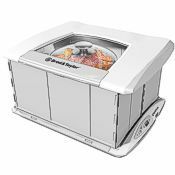 With the quick change head system you can switch from grinding dry grains, beans and legumes to oily or wet grains, nuts, seeds or coffee, in just minutes. 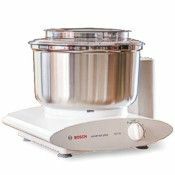 The Wonder Junior is a fast hand mill, producing 1-1/4 cups of fine wheat flour in 1 minute with very reasonable turning effort. It has a generous hopper capacity of over 1 quart. Stone Burrs: The thick, 4" diameter corundum stone burrs of the Wonder Junior mill are formulated to combine aggressive precision grinding with long burr life. 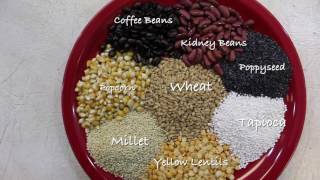 Using the stone burrs, your Wonder Junior can grind wheat (both hard and soft), oat groats (dehulled oats), rice, triticale, kamut, spelt, dry beans, lentils, dent (field) corn, popcorn, dried sweet corn, split peas, buckwheat, barley, rye, millet, teff, quinoa, amaranth, sorghum, dried mung beans, garbanzos, and more (all dry grains and beans.) 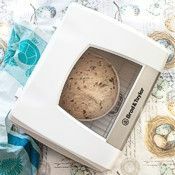 The Wonder Junior can easily be adjusted to grind coarse, fine, or anywhere in between—so you're ready to make flour, grain meal, cereal grinds, cracked grain... you name it. Switching between stone and steel burrs takes only a couple of minutes. Stainless Steel Burrs: The 4" diameter stainless steel burrs of the Wonder Junior mill can be used with any of the dry grains and beans that the stone burrs can be used with. In addition, the steel burrs can be used for oily or wet materials that would gum up and/or clog grinders that use only stone burrs or impact-style milling heads. In conjunction with its newly redesigned, highly aggressive feed auger, when using the steel burrs the Wonder Junior mill can grind nuts, coffee beans, herbs, spices, oilseeds like flax, fibrous materials or sprouted seeds or grains, cacao nibs, dried bone, alum and more. (The Wonder Junior is not suitable for grinding dried carrots or mesquite bean pods.) 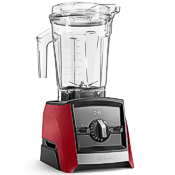 The Wonder Junior can easily be adjusted to grind coarse, fine, or anywhere in between. 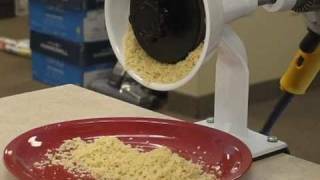 The steel burrs prepare you to easily turn out nut butters, grain flour, steel cut oats, meal, cracked grain and more. The Wonder Junior grain mill equipped with its steel burrs has the widest range of grinding capability that can be found. Read the Wonder Junior Deluxe grinding list here. Rugged construction: The robust construction of the Wonder Junior grain mill is seen in its solid metal unibody design, heavy duty replaceable bronze bearings, large diameter (5/8") steel drive shaft and a heavy duty crank arm with handle that's sized to be comfortable for every hand. Each component of the Wonder Junior is more than strong enough for decades of daily use. The construction of the milling body extends to the milling heads as well. The steel and the corundum stone burrs alike are engineered for both excellent grinding performance and long life. The entire main body of the mill is powder coated—a food safe, super tough, long-lasting finish that helps make cleanup a breeze. Dual Grip Clamp: The Wonder Junior's table clamp wasn't an after-thought, as is the case with many mills. It attaches easily, and with its large dual clamp screws it won't slip during grinding. 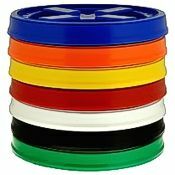 The large swivel pads on each screw mean it won't chew up your table, and it accommodates surfaces up to 2-1/8" thick. 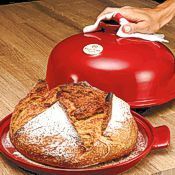 Quick Cleanup: It takes just one to two minutes to clean the mill out after grinding a material like dry grain, and a handy brush is included that makes it easy. Because the Wonder Junior Deluxe includes the Flour Guide as standard equipment, you won't have flour scattered around on your counter. 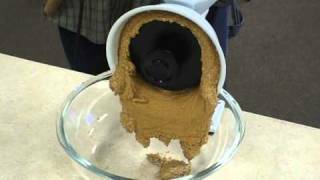 Cleanup takes a little longer after grinding wet or oily products (like when making nut butter), but the mill's quick, tool-free takedown makes any cleanup simple and hassle-free. Options: The Wonder Junior Deluxe comes very well supplied with all of the essentials. Included standard are the mill itself, the stone burr set, the steel burr set, the flour guide, the table clamp and a handy cleaning brush. 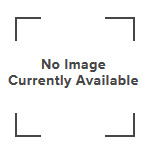 Optional available items include the drill adapter and the pulley wheel. The Wonder Junior is a well thought out and well built mill that's ready to go the distance. The Drill Adapter and Pulley accessories are shown below. Other accessories that are included standard with the mill can be seen on our Wonder Junior Deluxe grinder parts page in case you want a spare or replacement, or bought your mill earlier without one of the things that now comes with the mill. I've ground coffee, peanut butter, as well as wheat flour. I wore my last grinder out. I think this one will outlast my grandchildren! After trying several cheaper grinders that didn't do a good job I decided to go with the wonder junior deluxe. The quality was as good as mills that were MUCH more expensive. It was one of the few mills in this price range that would also handle wet grinding like nuts etc. I feel confident that this grinder will meet my needs for years to come. Very easy to use and clean up is a breeze too. We love making fresh bread and being able to grind the grains yourself. It's awesome. One of the fastest hand mills I have used. I can quickly grind enough flour, wheat, oats, etc. 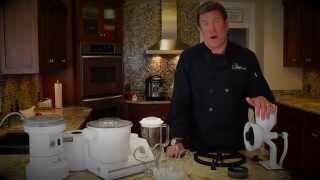 for a loaf of bread in no time. Glad I bought it. 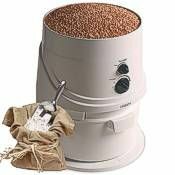 I just recently purchased the Wonder Mill Jr. because I wanted a reasonably priced, hand operated grain mill, rather than an electric mill (if the power goes out it wouldn't do much good). I got a cheaper mill and destroyed it in ten minutes (broke the gear off) The Wonder Junior. has worked really well so far. I'm still learning how to adjust the stone grinding heads for the type of flour I need. The bread that I have made has been fabulous! The only problem I had was there wasn't a lock washer on the back of the handle, so it kept spinning itself off, but I put one on myself and remedied that little inconvenience. Even with that said, I'd actually give the Wonder Junior 4-1/2 stars. 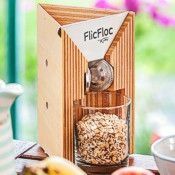 Nice, sturdy, reasonably priced, versatile, wonderfully made mill. Thanks. I have been happy with this mill without regrets. 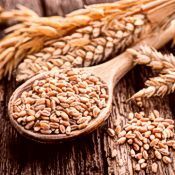 I have hand ground different types of wheat and look forward to peanut butter. I just have to plan ahead a little more especially when I need 10 cups of flour. Highest quality even at the affordable price. 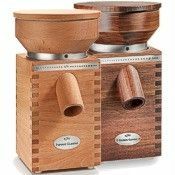 The Wonder Junior mill is beautifully designed for a lifetime of steady use. Easy to clean and simple to operate. Between the stone and steel burrs, it grinds virtually any grain, bean or seed. I've been using an old steel grinder. This new Wonder Junior mill is great, even better than expected. So easy, does so many things. How someone can not have good results is not understood by me. Using it is fall-off-a-log easy. Looking forward to some different grains and maybe some peanut butter. I'm amazed at how high the quality of this mill is. 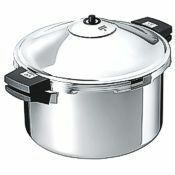 This is as heavy duty as you can get, but still be easy to use. It's straightforward and grinds so many more grains, nuts and seeds/legumes than any other mill I found while I was searching. I'm a senior citizen trying to eliminate chemicals and additives from my diet and this is already helping me do that. I want my grandchildren to benefit from it too. It takes no electricity and it's a great workout for my arms too! 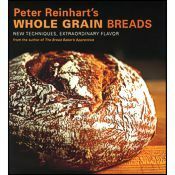 Great item for our food class at Hagen Junior High! LOVE! LOVE! LOVE it! Our 7th graders think it is so cool!! !